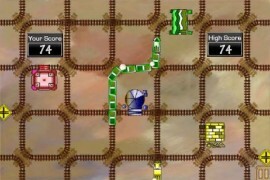 App Review: Trains by ZAGG Inc. 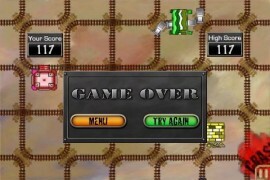 Trains by ZAGG Inc. is a fun game that tests your speed and ability to multi-task. The goal of the game is to direct the trains coming onto the screen through the station with the same color as the train and off again without running into another train. There are four different colors of trains, each with a different length and speed. To warn you when a train is coming, a flashing railroad crossing sign will appear on the edge of the screen. To guide the right train to the right station, you must change the direction of the track at the crossings. To change the direction of the crossing, simply tap on the center of the crossing. There are three different arrangements for the crossings that the app cycles through, so plan early and get your track set. It is difficult to make last minute changes to the track and get them right. Each section of the train coming through the station counts as a point. So. longer trains, which also happen to be faster, are worth more points than the smaller and slower ones. If your train does not make it through the station, but goes off of the screen, there are no penalties or points given. However, if your trains crash, it’s game over. Trains is a great game very similar to Flight Control. I really like how you can guide trains off of the screen at no penalty. This game is definitely worth a dollar. Trains is $0.99 in the iTunes App Store.